You can’t deny it. Just imagining biting down into a juicy piece of meat prepared just right makes you mouth water, right? While there are lots of different types of meat and ways to prepare it, no one can deny the draw of the famous Baltimore pit beef sandwich. From the choice cuts of meat, to how it is cooked and the special sauce used, a pit beef sandwich is like no other sandwich you have experienced before. Here is a little of why the pit beef sandwich is a meat lover’s dream? Baltimore BBQ has a distinctive flavor that you can’t get anywhere else. In Baltimore when you say barbecue what you really mean is Baltimore pit beef which basically is barbecued beef that is crusty on the outside and juicy and almost rare on the inside. The meat is shaved into thin strips and heaped high on a sandwich. People come far and wide for a Baltimore pit beef sandwich. Most of the time top round is used instead of brisket which is the favorite in a lot of the other styles of barbecue. The bread also adds to the tastiness of the sandwich. Pit Beef is served on a Kaiser Roll or rye bread which give an earthy flavor to the sandwich. What else makes this such a signature Baltimore dish is the sauce. Unlike other regions which use a mix of ketchup, brown sugar or vinegar to give the meat its flavor, the sauce used with Baltimore pit beef has horseradish sauce in it which keeps the customers coming back for more. What adds to the unique flavoring of a Baltimore pit beef sandwich is how it is cooked. Cooking it over an open charcoal pit adds to the rich, earthy flavor of the meat. This method of cooking if different from other barbecue styles and makes it stand out. Pit Beef doesn’t have to be cooked as long and so customers are guaranteed to have a sandwich that is crisp on the outside and juicy on the inside. Meat lovers know what they like so they appreciate being able to have control over how their sandwich turns out. That is why they love the pit beef sandwich so much. They can have it prepared exactly how they like it, not overcooked or cooked too much, just like they want it. There are no unpleasant surprises when it comes to a pit beef sandwich, just juicy goodness. If you were to ask a meat lover, if there can ever be too much meat in a sandwich, they would give you an emphatic ‘no’. To meat lovers, there can never be too much meat that is why they love the pit beef sandwich. These sandwiches are piled high with so much meat that you might think you will need a crane to prop open your mouth wide enough to bite down on these piles of heaven. Why Chaps Is One of the Best? 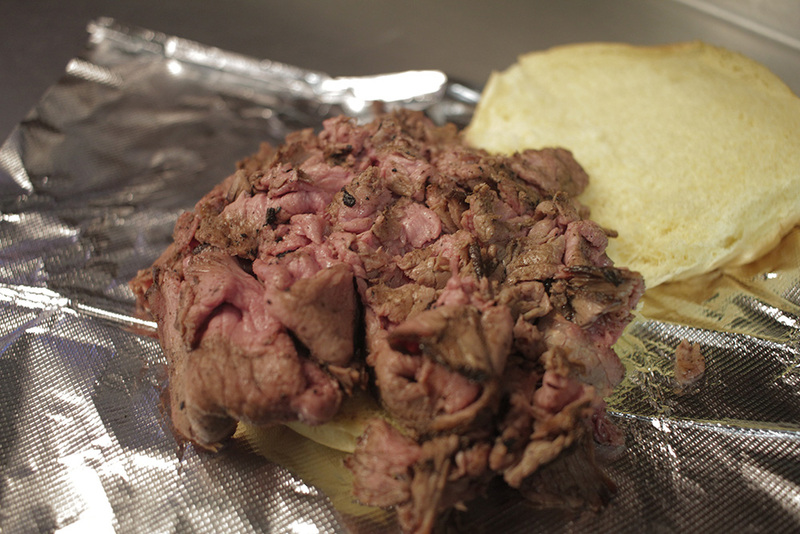 Chaps Pit Beef is one of the pioneers of modern day Baltimore pit beef sandwich. Chaps “Baltimore Style BBQ” method is what made their original pit beef sandwich so famous. To make a Classic Pit Beef sandwich, Bob Creager and his staff uses a bottom round roast flat cut from the hind quarters which are a tougher, but more flavorful cut. They trim the gristle and silver off the meat and then applies a dry rub of different herbs and spices like paprika, salt and pepper, thyme and onion powder. He then lets it sit overnight and in the morning he puts it on an open pit of burning hardwood charcoal that gets to gets to about 400 to 500 degrees. Once the beef has a nice crust on the outside and is tender on the inside, he slices it in ribbons and puts it back on the pit so he can cook to order for each of his customers. He always make sure to spread the meat around to add some char and flavor to it. Next he shaves the meat and piles it high on a kaiser roll and adds whatever fixings the customer wants, including Chaps’ special tiger sauce which is a mixture of mayonnaise and extra hot horseradish. The food is always cooked to order. Glava had already been serving pit beef at his bar, Gus’ Manor Inn which is located in Dundalk, Maryland and knew his new son-in-law loved to cook so thought it would be a great career transition for Creager. Chaps is also looking to expand its franchise program even more so they can bring their own personal brand of Baltimore BBQ to more people. If you are a meat lover looking to get into the barbecue franchise business, consider becoming a franchisee of Chaps Pit Beef. They are committed to helping their franchisees grow and offer a strong support structure and the benefit of their 20 plus years of experience in the barbecue restaurant business. Chaps already has a strong reputation and brand that you can use to foster growth in your franchise unit. What could be better than surrounding yourself with the food you love all day long? Contact Chaps Pit Beef today for more information about barbecue franchise. Hello! Was at your Aberdeen location this weekend and couldn’t believe how hot the horseradish was. Is it a particular brand? Do you grind it fresh? Thanks!